The UK's Guardian newspaper has launched a paid-for news app, charging users a one-off fee of £2.39. 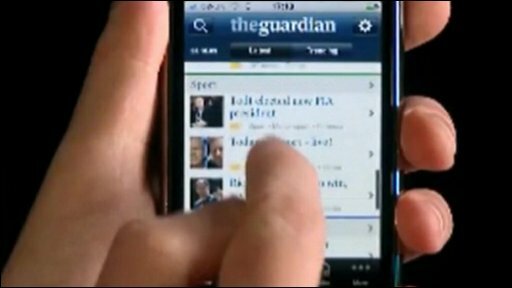 Despite charging for the app, the Guardian's website and mobile platform will remain free. The app, by UK developer 2ergo, will offer news, comment, features, audio and photos but currently no video. Writing in his blog about the application, The Guardian's mobile product manager Jonathon Moore answered criticism of the decision to charge for it. "At an early stage we decided to set the bar high, which hopefully means the app has been planned, designed, tested and developed to offer a truly engaging experience," he said. "The investment involved in this requires us to ask a small fee in return," he said. Martin Garner, director of mobile internet at research firm CCS Insight sees the app as an "experiment". "The app provides a better user experience but there are still a lot of substitutes online and via other mobile platforms," he said. "We will probably see a lot of people move to a more charged-for model over the next few years but whether users will pay or not remains to be seen," he said. The debate about how newspapers manage their digital content is a hot topic at the moment. Earlier this month, Google agreed to close the backdoor on users entering subscription-based websites via its search pages by limiting the number of free clicks they could make.